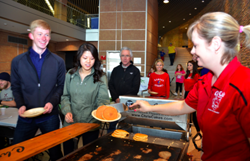 LAWRENCE — The University of Kansas School of Engineering Self Engineering Leadership Fellows Program will hold its annual Flapjacks for Philanthropy pancake feed from 11 a.m. until 2 p.m. Wednesday, March 30, in the LEEP2 McClendon Atrium. Flapjacks for Philanthropy offers the SELF Program an opportunity to raise money for a charity and give back to the community. Tickets are $5 in advance or $6 at the door. Advance tickets are available from SELF Fellows by calling 785-864-3881 or by stopping by the Engineering Student Success Suite, LEEP2, Room 1415. Kansas City-based Chris Cakes will cater the event with their signature pancake batter. Sausage, coffee and orange drink will also be provided. This marks the ninth year for Flapjacks for Philanthropy. To date, the program has raised more than $15,000 for various charities. Past beneficiaries include DCCCA, GaDuGi SafeCenter, the Willow Domestic Violence Center and Heartland Community Health Center.